Windows Live Writer is a blogging tool designed to make it easy to compose and publish posts on websites using WordPress, Blogger, Typepad, Sharepoint, or several other popular blogging platforms. But the last time Microsoft released a major update for Windows Live Writer was in 2012, and the company has no plans of continuing to developing a commercial version of the software. As for non-commercial? A group of Microsoft volunteers have followed through on a promise to release an open source version of the software. Meet Open Live Writer. 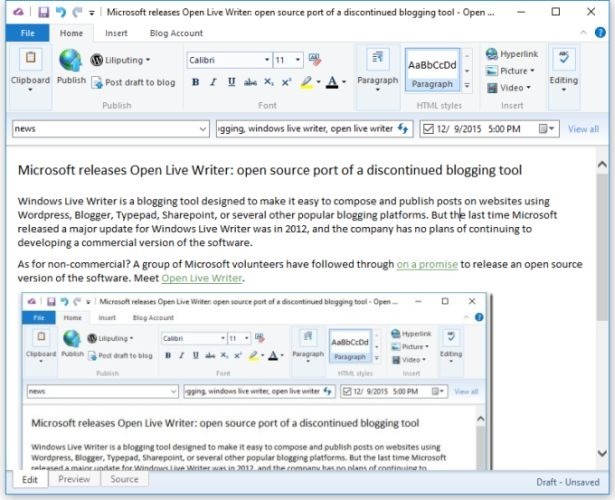 The new open source program doesn’t work exactly like the old Windows Live Writer: spell checking has been removed since the software used for that feature was old and wasn’t available for an open source release. But if you’re using Windows 8 or later you should be able to use the native spell checking features of the operating system in future versions of Open Live Writer. Open Live Writer is available as a free download, and you can also find ut the source code at github. Volunteers at Microsoft are continuing to develop the software, which is distributed in partnership with the .NET Foundation. But users can also submit feedback, pull requests, design ideas, and more. Incidentally, I used Open Live Writer to create this blog post. I’ve been using the web-based WordPress editor for so long that it took a little while to get used to the way Live Writer handles hyperlinks and images. It’s been years since I used an app like this. But overall it does provide a very simple user interface for writing, with tools that should be familiar to anyone that’s ever used Microsoft Word or a similar word processor. Cool. I never really got on with the tool when I tried it, but it might turn into something useful one day. Ugh! Both a Catastrophe Bar (“ribbon”) and the taint of .Net all over it. Fail. it smells like those linux frek here, their understanding of using friendly is a comand line with a thousand commands half of which are deprecated without telling the user anything about the commands themselves or which ones are deprecated. I would really like a good alternative to microsoft, but the ego of the autistic community has splited them into hundred distros instead of a unique user friendly, aple style one. So go whining away, its ur fault we dont have it.